On Tuesday, August 14, the Oral History Center organized interviews on the theme of 1968. The impact of events of that year can still be felt by those who lived it. What do they say about their memory of 1968, and how did the events affect their lives? Osher Lifelong Learning Institute hosted a day filled with plenary and breakout sessions about that year, including a talk by author David Margolick on his new book about Martin Luther King and Robert Kennedy. 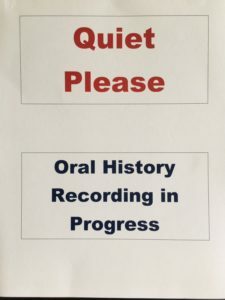 Throughout the day, and alongside these sessions, we conducted oral history interviews with OLLI members. We had a lot of help with the interviews: Paul O’Brien, oral history practitioner from Sheffield; Annie Valk, oral historian and faculty member from Williams College; Libby Herland, BCC alumna who has conducted many oral history interviews for the U.S. Fish and Wildlife Service; and Ginny O’Leary, a social psychologist and member of OLLI. Helping us record were Nicole Hall, BCC alumna and former Oral History Intern with us at BCC; Joe Makuc, also a former Housatonic Heritage Oral History Center at BCC Intern (for the Monterey Library), and current college student; and Wendy Germain, who has recorded numerous oral history interviews for us. It was the first collaboration of OLLI and the Housatonic Heritage Oral History Center at Berkshire Community College. Now, we will help OLLI to get these interviews prepared for the UMass Special Collections archive, where all of the Center’s interviews will be safely kept and available for online public viewing.